This is the final day of my week one on the fast metabolism diet and to say I am stoked is an understatement. Finally... A diet I can hang with and not starve and one that works with my desire to plan ahead and stay organized. The only few downsides are: it's a rich man's (or woman's) diet! Going to the fancy super markets section or whole foods (kill me now) is really expensive, but you are encouraged to eat organic, and aren't allowed to eat soy, dairy or wheat so the alternatives are all quite pricey. I've had to buy stuff I wouldn't normally and have gone ahead and bought a lot more organic than not. Haylie Pomroy recommends you eat organic for: eggs, dairy, chicken and beef. That's a lot more than I do now so it's been tough. The other thing that's been hard is I can just mindlessly eat... Most of the time that's great, I'm realizing how much I take a bite here or there from cleaning up my kids' plates or giving them a snack or two. But the saddest part so far has been no random hot cocoa or samples at Costco. Devastating I tell you. The cooking part has been fun. I've tried to keep it simple, and have even learned a few new recipes. 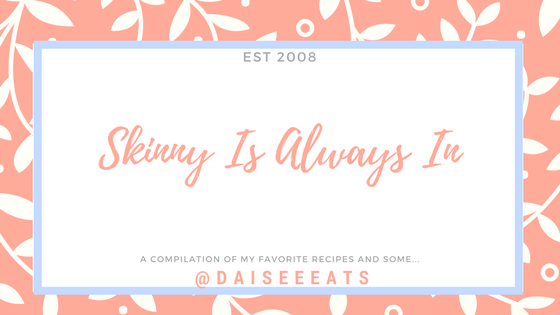 There are some recipes like the turkey chili in a crockpot and the coconut curry chicken that I definitely will be repeating even after the diet. Others like tuna with mustard and lemon for lunch - ick, kill me now. The other thing is realizing how much protein I actually should be adding to my diet. Or wanting to eat whenever you want instead of according to the schedule. Also, I really want a cheesecake for some reason. Not really much of the other stuff, but I really want a cheesecake. The good news is, I was looking through my meal planning for the next week and I actually put 5 weeks on my menu list instead of 4, so I'll be done with the diet a lot faster! So... thus far, three meals in, I am loving this diet. I am not hungry, or if I am - it's not for long, not more than the normal hunger pains from not having time to eat or waiting until you're home. For breakfast, I had 1/2 cup of oatmeal with blueberries and some natural sugar sprinkled on top, then I had an apple (but I found out later it was too small, should be about one cup worth of an apple so perhaps that's why I got hungry sooner than later). 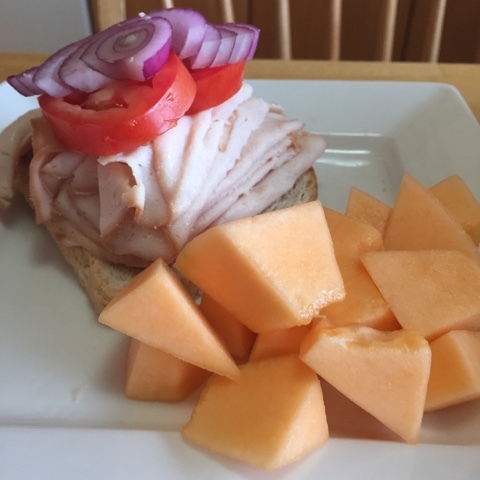 For lunch, I had 4 oz of nitrate free turkey meat, one sprouted piece of bread, a cup of cantaloupe, and topped the open faced sandwich with some tomatoes and red onions. 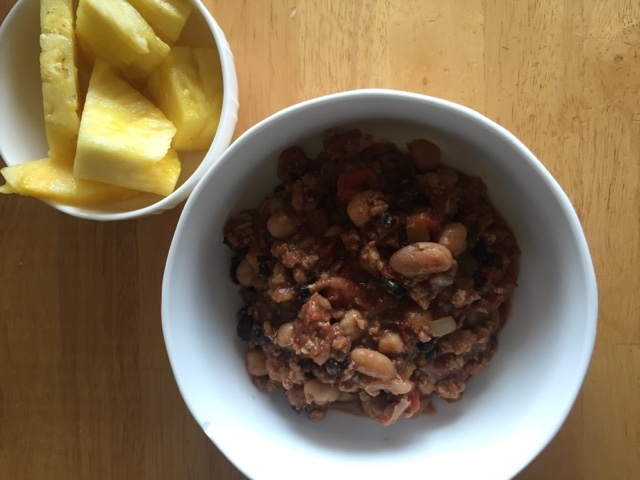 For dinner, I had 1 1/2 cups of turkey chili (with beans, ground turkey, and zucchini). My snacks were: an apple and two clementines. Observations: I normally mindlessly eat small things here and there. When I'm cleaning up my boys plates from breakfast or lunch, if there's anything leftover small or big, I find myself taking a few bites. It's a natural reaction from years of enduring my Chinese mother's demands that I eat everything off of my plate. Did I want to marry a crater face by leaving specks of rice in my bowl? Growing up, we didn't have the luxury of leaving anything on our plate. We were conditioned to eat it all. I also found myself grabbing for things before I had to stop myself and think, oh wait - why am I even trying to eat this? I had some leftover dark chocolate in the car, and I almost MINDLESSLY ate a bite, was not even hungry! I wasn't really hungry until right before meal time. I am so excited about the diet that I'm finding it hard to sleep but still got pretty good rest earlier than normal. Also, I eat a lot more fruit than the diet permits on a regular basis... which means I'm probably taking in a lot more sugar albeit natural. I found myself thinking, what... this is all the fruit I get? I mean, I can literally sit there and eat an entire cantaloupe myself. So I did have to hold back from eating more fruit. Overall, day 1 was a success and I'm looking forward to day 2. 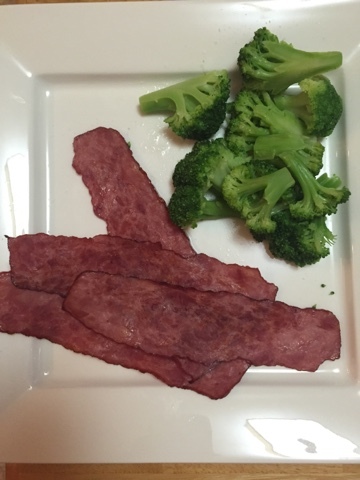 Fast Metabolism Diet: Here I Come!! After failing with dieting for the past four years, three babies later... I am finally trying something new with a reinvigorated zeal! It is called.... the Fast Metabolism Diet. For 28 days, I will no longer be allowed to eat soy, dairy, sugar, gluten, corn, peanuts, bananas, or grapes. On the flipside, I will be able to eat veggies, protein, brown grains, and fruit. I'm pretty excited about meal planning for the first week.. and preparing, but I'll update with results.